Over the last several weeks I’ve shared my journey with using whole grains and a little bit about how whole grains have been used throughout history. This week I want to briefly discuss the nutritional benefits of whole grains in general. 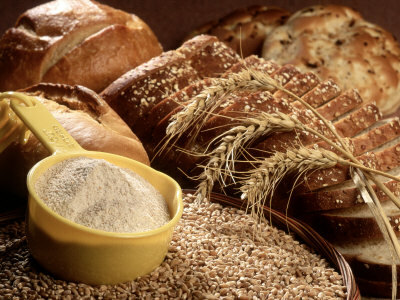 Whole grains contain protein, fiber, healthy fats, and a generous amount of vitamins and minerals. These components work together synergistically. Any one of these taken alone is not going to benefit us the way it would as a whole, and may actually be detrimental. The more I learn about “whole foods” the more I realize that anytime we try to “improve” or alter food from the way God made it, there’s a price to be paid. While whole grains are primarily carbohydrates we must reorganize our thinking. Foods with complex structures should not be put into one nutrient category. This again emphasizes the value of synergism-the effect on the body nutrients have when working together. For example, the value of B-vitamins is enhanced in the presence of vitamin E. The multitude of interactions between food nutrients is intricate and complex. The result is that the whole is greater than the sum of it’s parts. When we begin to try to isolate different nutrients and separate them from the whole, we lose out on the interaction between the parts, with detrimental results. In addition, researchers continue to discover new nutrients and new interactions between them all the time, which can’t possibly be replicated in refined grains. All types of grain (wheat, rice, oats, barley, etc.) consist of three parts: endosperm, germ, and bran. The endosperm contains carbohydrates, protein, and several vitamins. The germ contains vitamin E, other antioxidants, B vitamins (including folic acid), iron, zinc, and other minerals, and polyunsaturated fats. The bran contains fiber, antioxidants, many phytonutrients and minerals, and phytates (which we’ll learn more about in a minute when we discuss soaking grains). Processed “white” flour (or rice, or any other processed grain) has had both the germ and the bran removed. What remains is essentially straight starch, which spikes your blood sugar and is stored as fat. Even store-bought “whole wheat” flour consists of just part of the bran and the endosperm. The highly nutritious wheat germ has been removed. As I’ve mentioned before, the moment a grain is broken open it begins to oxidize. Within 72 hours, over 90% of the nutrients are gone. So even what’s left behind is depleted by the time it reaches the grocery store shelf. A friend of mine once quipped that her kids would likely get more nutrition from licking the floor than eating refined grain products. In other words, the dirt on the floor would have more nutritional value! Gross, but sadly probably true. Whole grains are very filling and satisfying because of their high energy value (i.e. calories). This does NOT necessarily mean, though, that “bread is fattening”. Complex carbohydrates are burned at a rate of 25% during digestion, compared to 3% for fats. The accusation may stick for refined grains, but not whole grains. Because of the prevalence of grain-related allergies, I’ve chosen to use a wide variety of grains in my cooking. There’s some speculation that overeating one grain repeatedly can trigger intolerance and allergy. Historically, though, different cultures have relied on one local grain exclusively without negative reactions. It seems likely then that the issue is not the particular grain, but using it in a refined form. Another thing to consider is that our bodies are likely to adapt best to the grains of our ancestors. So, Asians tend to thrive on rice, etc. It’s wise to consider your family’s ancestry when choosing grains. Many of us have a mixed ancestry, so avoiding a dependence on any one grain and using a variety is probably a wise choice. I’ve mentioned before that soaking or sprouting grains is considered by many a wise choice. Since grains are basically seeds they contain phytates, enzyme inhibitors, and anti-nutrients meant to protect them until they’re ready to sprout and keep them intact on a trip through the digestive system (think about how some seeds are spread…by birds and other animals who eat them and “deposit” them, intact, in another location). Not only does this mean that when eating unsoaked grains we’re not able to benefit from many of the nutrients, but they may actually inhibit other enzyme activity in our digestive system, decreasing what we’re able to absorb from other food as well. Soaking the grain in an acidic medium like buttermilk before using mimics the effect of sprouting, breaking down the phytates and other anti-nutrients and making the good stuff more readily available. It also has the added benefit of “predigesting” the grain, breaking down hard to digest starches and tannins, as well as the gluten, which is particularly difficult for many. This makes it easier for our bodies to absorb the many beneficial nutrients and makes the grains easier to digest overall. In the course of writing this series, I discovered that one of my favorite real food bloggers, Katie at Kitchen Stewardship, has been doing a very comprehensive series on the whole issue of soaking grains, so rather than reinvent the wheel, I refer you to her excellent posts! Different grains work for different purposes. A common way to classify them is by their gluten content: gluten-free, low-gluten, or high-gluten. Gluten is a protein that develops elasticity when kneaded. This makes high-gluten grains like hard wheat ideal for yeast breads because this elasticity helps trap the gas formed by the yeast, giving rise and lightness of texture. Unfortunately, gluten is difficult for many to digest, but soaking the grain can help alleviate this and allow some with gluten sensitivity to still enjoy these grains. Quick breads without yeast such as muffins, pancakes, biscuits, cakes, and cookies, do well with low-gluten grains or soft wheat. If high-gluten grains are used in these, they cause the texture to become tough and dense. There’s much more that could be said about grains in general, but this quick crash-course gives some solid background knowledge for you. Next time, I’ll begin focusing on one variety of grain at a time, discussing it’s particular characteristics and giving suggestions for use. I’ll begin with the one we’re all most familiar with: wheat. What role does wheat play in our health? What’s the difference between the various types of wheat available? What’s the best way to use it and how should it be stored? Kara – I recently got a breadmaker for my bday and love it! I can't wait to try making new kinds of bread and rolls! Stopping by from HHH today hi! We enjoyed Popcorn Cornbread at a friend's home this week – and we soaked our barely this afternoon. I am enjoying the whole grains. Stoppin by on the HHH! I always enjoy reading information on eating the whole food way. Having a family history of Celiac Disease, we go on gluten free runs to monitor any changes that may take place in our bodies. Its so sad that the American Diet is overprocessed and many still do not know, care or understand the impact on the garbage people are putting into their bodies…epecially the church body that still thinks goldfish crackers are a healthy snack. YES! Thank you for posting this! We grind our wheat and bake our bread. Baking the bread, without freshly ground wheat is fun, but you miss the nutrients and vitamins….and it's no diff than the store-bought bread!!! YIPPEE!!!! SHared your post on my FB page! Found you through iFellowship and the HHH!